It’s peach week! I love peaches and I love french toast, so it was inevitable that I would combine the two. 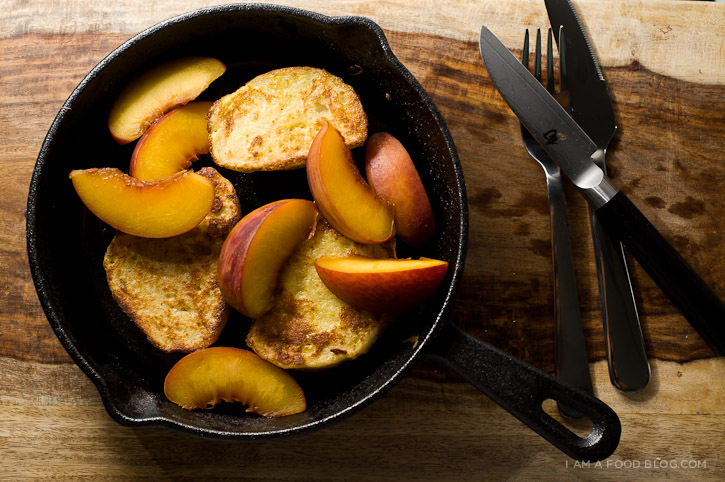 Peaches and French toast go together so perfectly. 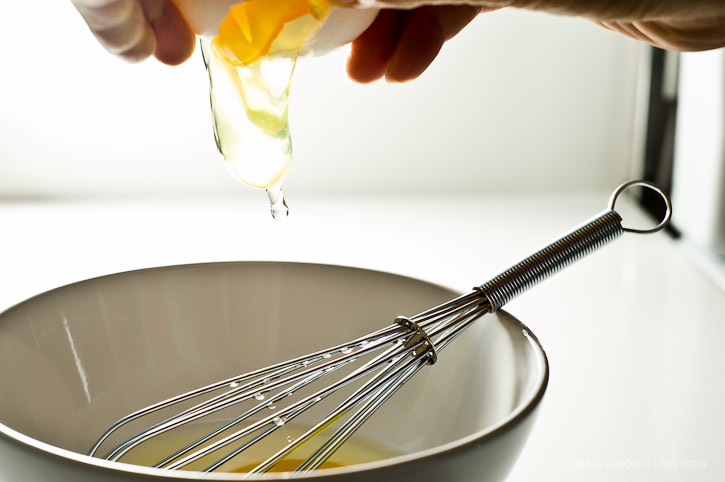 Add some bourbon sauce in the mix and you have a winner. I have a confession for you: as much as I love fresh peaches, I also harbour a childhood love for peaches in syrup. I’m not talking about fresh peaches that I’ve lovingly canned by hand. No, I’m talking about peaches packed in syrup. Remember how Delmonte used to come in those tiny green cans with the metal pull tabs? Those were the best! I haven’t had canned peaches in ages, but when I was elementary school my mom used to pack a green can in my lunch everyday. It’s so strange to hear about all the American kids going back to school already. It’s still August! In Canada, at least on the West Coast, back to school is most definitely in September, after Labour Day. To be honest, I kind of miss back to school. Actually, who am I kidding—I just miss back-to-school shopping and fresh school supplies. Still, I’d gladly give up freshly sharpened number 2 pencils for a breakfast with bourbon. 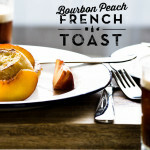 Bourbon, peaches and french toast: what more can I say? 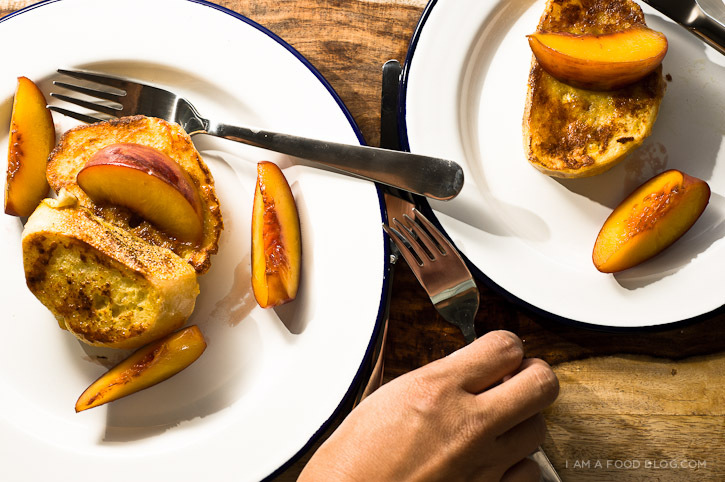 i am breakfast, i am dessert: i am bourbon peach french toast! 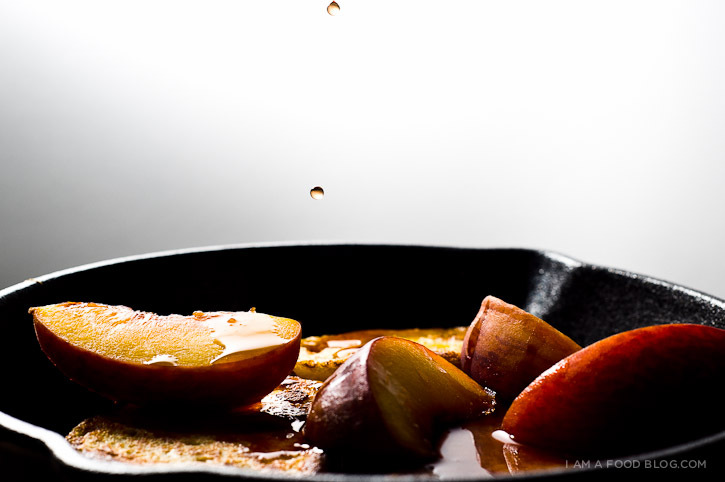 While your toast is getting golden, make your peach bourbon syrup. In a small saucepan, Bring the sugars, bourbon and water to a boil over high heat. Turn the heat to medium-low, add the peaches and let the syrup bubble gently and reduce until a syrup like consistency, about 5-6 minutes. Keep an eye on it so it doesn’t burn! 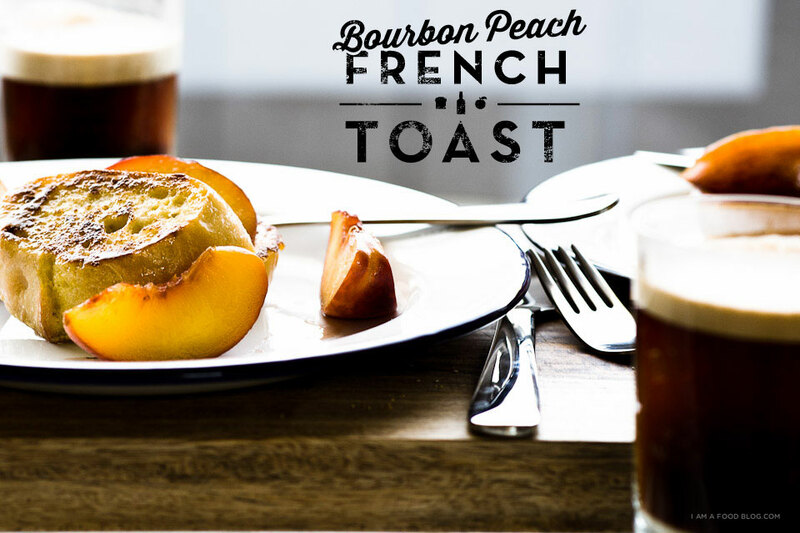 Top your french toast with the bourbon peaches and enjoy! PS – I’ve started instagraming daily. I am officially addicted! Gorgeous pictures! Are these all via Instagram? Just tried this, trades peaches for nectarines and bourbon for whiskey and it was great, thanks.